Some days are better than others. Last Friday was one of better. Perfect weather, nice waves. Not too much kelp. 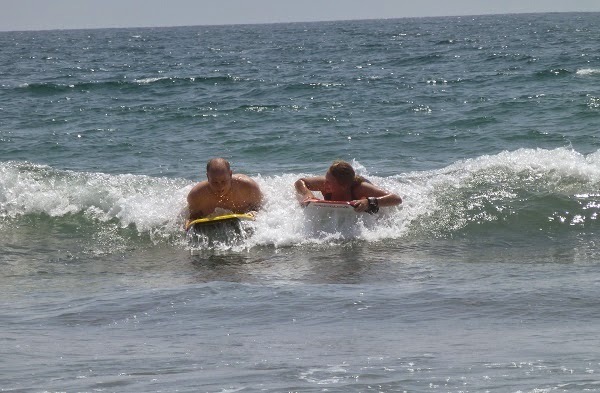 Boogie boards... an amazing amount of fun for something that's pretty easy to do in the right waves. Surfing... something that looks easy but takes skill. It helps when you start when your 5 and not 50. That didn't stop me from trying though. I'm very proud that I actually got up, on my own. 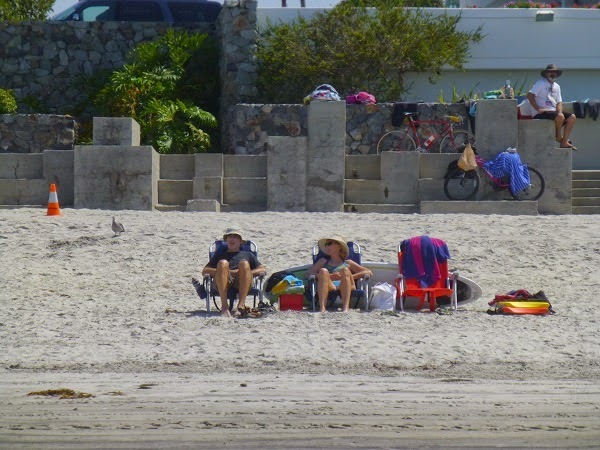 Like I said, the waves were good (as in good and not too big). Especially nice was having family around. It's rare to get all the family together at once, and this was no exception. For dinner my dad and brother and niece were there, my husband was home, and his folks came over.. not everyone, but a nice gathering none the less. The plan was to highlight the fish caught on the 5-day fishing trip my dad and brother just returned from. We had yellowtail and yellow-fin tuna. 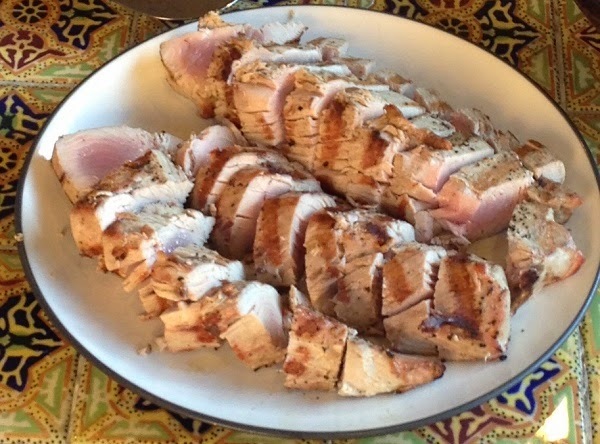 The plan for the tuna was to just season with salt and pepper, and cook on high heat for just a minute or two per side, which resulted in a nice rare interior. The fillets were sliced for a pretty presentation. Really good, really simple. The yellowtail was grilled on foil, similar to the way I do salmon. It's simple too, but the salmon recipe seems more complicated, as it includes a sauce and seems limited to salmon. I wanted to include the more generic version because its the way I cook fish at least 80% of the time. We had 3 chefs tending the grill, resulting in perfectly cooked fish. The dinner was rounded out with brown rice, a green bean salad (I''ll get the recipe for the lemon-mustard dressing posted as soon as I make it again and measure amounts), and a peach salsa (something like this, but with peaches instead of mangos). For dessert, we had grilled figs on vanilla gelato. A good day overall. This is my go-to method for cooking any meaty fish, like yellowtail, halibut, salmon, as well as some of the local sea bass and baqueta grouper we get. Preheat a gas grill to medium (350-400F). Make a foil pan: get a piece of foil that’s a bit over 2x the size of the fillets side by side. Fold the foil in half (I always do shiny side out, but not sure it matters). Lay the fillets on the foil, skin side down if they have skin, with maybe a ½ inch between them. If there are thin tail sections, fold the thin part under to get a more even thickness. 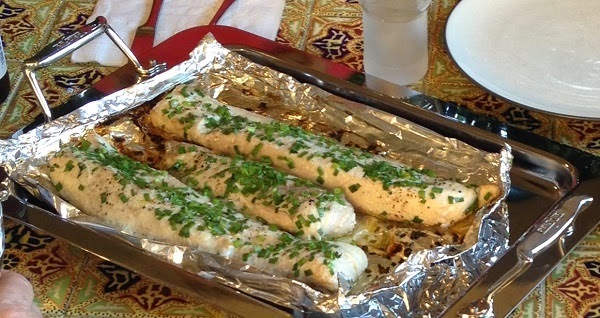 Fold up the sides of the foil to make a ½ inch lip around the fish. Put a thin coating of oil on top of the fish pieces, and if they are skinless, put a little oil under the fillets too. Squeeze a little lemon or lime juice on top, then sprinkle with salt and pepper. Top with a nice sprinkle of herbs. Place the foil on the grill, over the burners. Cook until just done. I plan for about 10 minutes per inch of thickness, but start testing sooner.